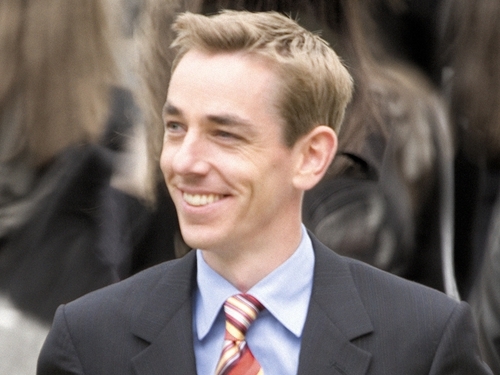 Ryan Tubridy talks to RTÉ.ie's Taragh Loughrey-Grant about his plans as the new presenter of 'The Late Late Show'. Taragh Loughrey-Grant: The launch of RTÉ's Autumn Schedule marks the dawning of your new role presenting The Late Late Show, how do you feel? Ryan Tubridy: I feel good but I am extremely nervous even though there's three weeks to go it feels as though it might as well be tomorrow. The nervousness is starting to build, it started to build when I got back to work on Monday and if you can imagine it's like the tanks have started their engines and they're rumbling, they're just at the other side of the hill and they're coming. Its like 'Saving Private Ryan', I'm going to come off the boat onto the beach and the… [He makes machine gun noises!] That's the sort of pleasant analogy I've drawn." TLG: The wheels are indeed in motion; your sponsor was announced this week: "I'm very pleased about that one. I'm so glad it's an Irish sponsor, Quinn, a nice honest Cavan business. RT: I wouldn't have been really happy if it was a big British conglomerate. I'm really glad we were able to pull an Irish sponsor out of the bag, given the times we live in. I'm a proud Irish man so that means a lot to me. TLG: Talking all things Irish, you had a staycation in the West this year. RT: Yes I did, now more than ever its needed and I'd a lovely time at home. TLG: What can you tell us about the new Late Late Show? RT: I can tell you that the owl is not dead. I can tell you that the set will be different. I can tell you that there will be interesting things happening from the moment that the show is handed over to us at 9.31pm on Friday 4 September. It is a new reality but it's still the Late Late Show. TLG: Will there be a new theme tune? RT: Cannot discuss! [Smiling] Yeah, that's a mystery; it’s a very exciting mystery. There's a new set and there will be a house-band. I'm really happy about that and you will see familiar faces in that line-up. It'll be the Late Late band and there'll be familiar faces from before [the Camembert Quartet was the Tubridy Tonight house band] but it's not necessarily the same band as before. That was then, this is now. They're a new band, technically brilliant and comically brilliant. They won't be there all the time, you won't see them as much as on previous TV shows I presented but there will be live music present. TLG: What are the plans regarding guests? RT: We're currently looking at a series of names of people who we think will reflect where we are today in Ireland politically, socially, religiously and culturally so panels will be alive and well. Sure we're great talkers; we like to look at each other talking so there'll be plenty of that. There'll be a happy blend of entertainment and information on the show. There'll be plenty of entertainment, which I love and I like my current affairs so it'll be good conversation. It's not a seminar, it’s a chat show. TLG: Where are you with your book on John F Kennedy? RT: I think I've exhausted every file in the National Library with the name Kennedy on it so that’s really good but I'm like a bad PHD student, I've accumulated all of the information but I haven't written a word. That's next. It's really interesting I've been covered in dusty folders from 1963, surrounding by books and like-minded nerds in libraries around the country and museums. It has been a beautiful distraction from the chaos of the La, la... I can't say the name of the show anymore; I call it that other show because I can't get my tongue, heart or head around it just yet. RT: Thank you; I may just do a Joe Duffy on it! To read our interview with Gay Byrne, click here.